I am now on turn 225 of an 1850 campaign as France, and I have noticed some substantial improvements since patch 1.04.3. The invincible doom stack is gone. The million man doomstack, which the AI used to create in European wars, and which could not be directly defeated, is thankfully gone. There were ways to deal with it, but until it was out of supply for awhile, it could crush anything in its path unless the terrain was heavily restricted. Now, the AI still forms big stacks, but they can be defeated directly, even in open terrain. It is a matter of planning, and organization and taking advantage of your leaders, but it can be done. While I have lost some battles, I have won battles where the AI will commit as many as 350,000 men and I have able to commit 250,000, in some cases inflicting devastating losses on the AI. The AI does a better job of massing troops in the right areas, attacking on different fronts, and the major European wars have been a real challenge. Wonderful stuff. AI use of navies and amphibious assaults. i almost never used to see this. But, in my current game, China sent a large army to take Hanoi by sea, which led to a war with France, and continued to use amphibious landings and there navy effectively during the war. In my war with Austria, i cut off several Austrian held provinces in central Italy by taking Venizia. The Austrians loaded reinforcements on their small navy and tried to send them to those cut off areas. Fortunately I was able to detect, intercept, and sink the reinforcements and their escorts in an enjoyable naval battle. If the AI is losing the war, they will make reasonable peace offers, which often leads to the short wars that often occurred in this period. This was an area of the game that was an afterthought for me, needed mainly for getting commercial treaties and casus belli. Your actions, other than declaring war, rarely had consequences. The game is much deeper now. Prior to the patch, i would just use this action where ever I had an interest without much thought, and it would almost always substantially increase my relationship over time. This allowed me to choose the wars i wanted to fight. But now, the action is not immediately available, though it does appear after a few years. But if you fail to back up your promise by declaring war once it gives you a casus belli, their is an immediate prestige penalty. And if you persist in failing to honor your commitment, you can lose ten percent of your entire prestige score at intervals. If you have promised local support to two different nations who go to war with each other, you are in trouble, as you cannot declare war on either, and will continue to accrue large prestige penalties. This happened in my current game, where I promised local support to both Prussia and Russia, and suffered heavy prestige loss when they went to war, a was that ended indecisively after a year. By the same token, if the AI had promised local support to a nation, and you declare war on that nation, there is a substantial danger that the first nation will declare war on you. Defensive alliances work in a similar manner. This makes it crucial to review the treaties that a potential victim has with the other nations before you attack them, or you could wind up with a much bigger war than you want. That said, promising local support is the most effective way of getting a nation to like you, but it comes with a big risk. This works much better than it used to. It is much easier to get the AI to accept a reasonable peace offer, and the wars between the AI are often resolved within a year or so. If you are at was with a nation and its allies, and you make peace with the nation you are at war with, or your ally does, the allied nations will also make peace, automatically. There are other improvements, but these are the major ones I have noticed. Re: The latest patch has greatly imporved the game. Really re-assuring. The diplomacy improvements alone are massive - if the AI now takes defensive treaties seriously then a lot of the more 'gamey' stunts I pulled in Manufacturing Italy are not viable. This is good as it forces a player towards alliances to compensate. Also good that 'promise support' is not just a simple prestige boost. Sounds like you can tie yourself in knots with it if not careful. The end of the doomstack will make an AI Russia a foe to fear. Previously it would generate a huge army in St Petersburg and be unable to move it so it would show as having huge military potential but would tend to be beaten easily in wars from mid-game onwards. Loki, your prediction about AI Russia becoming a power to fear actually happened in my game. They declared war on Turkey, and conquered nearly every Ottoman province in Europe, and some in Asia. The game would give me glimpses of some of the battles as they occurred, enough to see the numbers involved, and there were no doomstacks. Prussia attacked the Russians a few years later, but did not take a single province, and made peace in less than a year. Russia also fought a war with China, and got a favorable treaty with transfers of territory, again, in less than a year. Russia is second to Britain in prestige points, probably from winning so many battles. And I did lose nearly 2000 prestige points for not honoring promises of local support. And the AI is honoring defensive treaties. In my two declarations of war against Austria, Austria's allies, including Saxony and Bavaria, all declared war on me. And Saxony sent a big army to attack me at Metz near the end of that war. The allies all declared war against Sardinia Piedmont when she declared war on Austria, as well. And something I should mention is that the time between turns is much faster. I have played over 200 turns, and am involved in a huge war, at the same time that the British are trying to put down the Indian Mutiny, and turns still process in no more than two minutes. Turn processing is now excellent. I think that RuS or Civil War2 now are slower - at least early game. The only state that seems to create 'odd' wars is France. So far in my game its managed to get into wars with the CSA (1850) and California (1851). I ended both by script. The diplo game is much more nuanced with fewer 'safe' options. The colonial game has changed - before you had a number of different cards that had essentially similar impact and the choice was which gave the best gain in CP for your current needs. That missionaries now hit revolt risk rather than help with CP (as does the chief bribing) gives the whole thing a new depth. very very impressed with .04.03. Good to have your input, Loki. Something else I have noticed. The fixes you made for the US Civil war seem to be working. While I am playing France, I often get views of battles all over the world when the turn ends. The US Civil war has been going on for almost two years, though the Union has almost won. I have seen a number of battles, between forces of historical size, which shows the Confederates as having decent armies. The Union eventually overwhelmed them, but it seems to be a substantial improvement over the previous situation. I too am quite impressed with the current state of the game. I don't see the point of missionaries now - 1% revolt reduction over 6 turns? Bribing gives you 10% reduction plus 5% loyalty. Partly agree, I'm having to rethink my colonial strategy, not least I think that getting to 35% is going to be slower. But missionaries are cheap and anything that reduces the need to deal with constant revolts is to be welcomed. loki100 wrote: Partly agree, I'm having to rethink my colonial strategy, not least I think that getting to 35% is going to be slower. I find missions invaluable as supply sources for my explorers, or for a single colonial brigade. They are the cheapest way to keep these units from starving. So are this the Regional Decisions missionaries or the units you can build. I am still exploring and totally lost. Durk wrote: So are this the Regional Decisions missionaries or the units you can build. I am still exploring and totally lost. These are the regional colonial cards. They are now much more differentiated than before as some give you loyalty/dev but no colonial penetration and so on. As Vaalen rightly pts out above, an important benefit even of a mission is it generates a bit of supply. Certainly enough for a colonial brigade or similar. So it allows you build your military control - essential if the locals are being unco-operative. The on map colonial unit - the explorer - is as before (I believe). Move it next to an unexplored region and then play the explorer card on that region. The unit can't move while the card period plays out, so you may want to protect it with a military unit .. which takes us back to the merits of a mission as above (or a trade post). The unit has a second advantage in that it might trigger the discovery of unknown resources. You know, I really like this game and its scope, but I am so lost at time as to the best play. I am learning. I have have some great players who have helped me learn more. This thread has been so useful. Well I am truely impressed. Having finally wrestled the Crimean event chain so it works ... guess where a huge Anglo-French army landed in Russia? loki100 wrote: Well I am truely impressed. 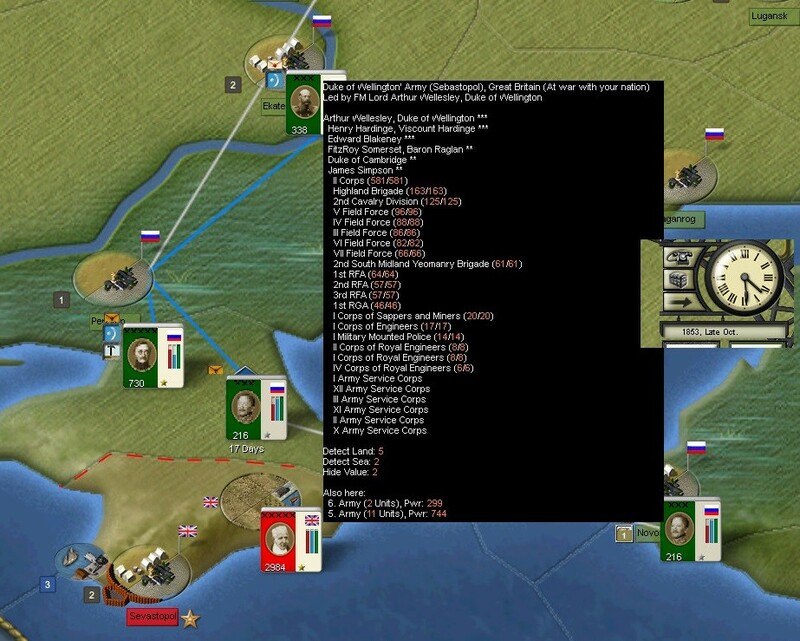 Having finally wrestled the Crimean event chain so it works ... guess where a huge Anglo-French army landed in Russia? The Crimea? Truly impressive. You have truly accomplished something wonderful. This is the final persuasion I need to start my own game as Russia, after your AAR got me interested. you mean the AI landed it or the script moved the army? Have any screenshot? Pocus wrote: you mean the AI landed it or the script moved the army? Have any screenshot? I think the AI did it all by itself. Somewhere in the later 1.03 patches the AI became quite good at naval invasions. That is a truly beautiful screenshot. Nice work! I have also noticed that the AI has become quite good at making naval invasions. Awesome, this is a joy for a developer to see that. The amphibious AI is rather intricate and complex. Thanks a lot. vaalen wrote: and I have noticed some substantial improvements since patch 1.04.3. Based on your and others comments here, I installed the patch and started a game as Britain and I have to say I agree completely with your statement above. I was floored when China declared war on me in 1851. In all the years playing PON I have never ever been attacked by an AI power except in scripted wars. This alone makes this one of the greatest patches ever. But then when I tried to retake Hong Kong, I was booted out by a 4k power Chinese army. Getting a huge army to China with that kind of power just seemed impossible, so hoping to simply drag on the conflict to see if they'd offer a white peace eventually, I stationed some troops to protect a small fleet in Singapore and have used it to keep China from breaking into the Indian Ocean and causing any trouble. Now several years later China has just invaded NE India with a sizable army forcing me to rush troops to the region. I am now going to have to deal with China and their huge land army if I hope to ever see an end to this war. I'm loving the changes and its only coming to the end of 1853. On an events note, the Crimea war started (not sure when, missed any announcements of it) and Britain and France were not pulled into it by any events. The Ottomans are on their own and of course losing badly. Jim, I am glad to hear that you have also been enjoying this greatly improved game. I have been attacked by the AI a number of times, something that never used to happen except for scripted wars. And I have had the pleasure and challenge of fighting China over Indochina, as France, when they attacked me with some serious amphibious attacks, and more than once, leading to some great naval action. Even though Russia attacked Turkey pretty early in your game, I do not think the Crimean War has fired yet, as you got no message. I believe it is possible for Russia to attack Turkey without the Crimean War event firing, though the event will not fire if Russia is at war with Turkey. But, once they make peace, I think it becomes possible for the event to happen, with a ten percent chance each turn between 1852 and 1862, if I remember correctly. Ah, that makes sense. The forces they attack with are not doomstacks, but they will far outnumber your colonial forces. But it is possible to defeat those monster behemoth armies with much smaller European forces, especially if you can get them to attack you. And I have found that China is quite willing to make peace once you have won a few battles. And they will send off smaller forces that are not hard to defeat. The problem is in attacking those monster forces, at least when all you have is smaller colonial forces. My fight for them over Tonkin was one of the most exciting and interesting conflicts I ever had in PON. I was involved in a huge European war with Austria at the same time, which made it difficult to send reinforcements. All I had were some colonial brigades, some Vietnamese native troops who joined me when I colonized their nation, The heroes of the Legion, a couple of marine brigades, two marine divisions, and a small naval force. I did lose some battles. But i was able to create a strong defensive position in Hanoi that beat off several huge Chinese attacks, and they eventually offered me peace. Great fun, and it had a real feel of the period about it. Well I just landed a 2500 power stack of Indian Colonial troops on Hong Kong. Six infantry divisions and the rest artillery (perhaps 8-12 units not sure exactly), the theory being massed long range fire from all those 6lb guns will crush the low tech hoards before they get in melee range. If that fails I just put together a 3k power stack in Britain of 4 guard corps, 2 artillery units and 5 two star leaders. Command is 50\50 and each corp has a dedicated leader attached to boost stats. As soon as the transports I built to lift them all at once complete they'll head to China if needed. Hopefully the Indian troops will pull it off though, as I'd hate to lose 4 guard corps in a no retreat battle at Hong Kong. Loving it though, lots of new types of fun I've never experienced before in PON. Really enjoy seeing all the announcements about minor powers choosing to join wars of their allies on their own accord. James D Burns wrote: Well I just landed a 2500 power stack of Indian Colonial troops on Hong Kong. Six infantry divisions and the rest artillery (perhaps 8-12 units not sure exactly), the theory being massed long range fire from all those 6lb guns will crush the low tech hoards before they get in melee range. That sounds great, Jim. I hope you will let us know how your assaults on Hong Kong go. You have designed two very interesting assault forces for the purpose. To me, one of the many joys of PON is that you can design a custom military force for a specific mission, and I am very interested in how your creations do. Well as you can see from this screenshot I put together, things do not look well for the Indian Colonials. I decided since Hong Kong was a mountain region which limits frontage, I would be better served if I could move north into the Canton region (6 day move) and take advantage of the open rice fields there and their expanded frontages. The British lost the battle as they moved into the region (I suspect only due to an auto attempt to retreat) and only managed to grab 9% of the region. Due to being massively outnumbered we proceeded to then lose 5% of that 9% before the turn ended, so we only hold 4% of the region at turn end. Even though the battle report shows General Xiang Rong and his troops took part, they are actually still one region north and haven't quite made it to Canton yet, so I suspect next turn will see the British violently ejected before they have any chance to recover significant cohesion. But the battle screen does show my theory holds some merit as we caused significant casualties at range while China did not. I suspect had we managed to dig in and recover most of our cohesion we might actually have a chance to win, but the Chinese are simply on us too fast. Edit: Boy was I wrong, the army to the north was not included in the 300k number. I ran the turn and we fled in the face of 700k Chinese taking just 1000 casualties to their 1500. But we then took 341 hits... ouch! We are now trapped in Hong Kong with a massive stack of Chinese in Canton sporting an 11000+ power rating lol, doesn't look good for the colonials. I may have to build enough transports to be able to float two entire 3k sized armies at one time to have any chance of remaining ashore here. This is again a proof of the over-extended FP...if you look at the Chinese units names, they are 90% new builds and far too many of them. This may have something to do with unit upgrades. I was trying to build out the Indian force pool before the Mughal rebellion, and after building 40 inf and 20 cavalry divisions with 10+ of each still in the pool, I got suspicious and decided to check a new games build pool stacks. Sure enough the max pool is 25 inf and 15 cav, so I'm way over the intended pool and the stack for divisions in my pool keeps renewing as my divisions upgrade. I think what is happening is after tech upgrades, the build pool stack does not upgrade, it is still a stack of old tech divisions. So when you build a new division the pool is depleted but as soon as that divisions elements all upgrade to the new tech, a division unit gets dumped back into the build pool stack as if the division was destroyed on map and it can be built again even though it actually is still in play as a new tech division. So this isn't specific to China, I think all or most nations may have this issue whenever a new tech is researched. Basically endless build pools. James D Burns wrote: This may have something to do with unit upgrades. I was trying to build out the Indian force pool before the Mughal rebellion, and after building 40 inf and 20 cavalry divisions with 10+ of each still in the pool, I got suspicious and decided to check a new games build pool stacks. Sure enough the max pool is 25 inf and 15 cav, so I'm way over the intended pool and the stack for divisions in my pool keeps renewing as my divisions upgrade. as a quick and dirty fix, just didn't think it was a problem with China too. This is actually a different issue I think. China and Britain are not building extra units added to their build pools, they are building endless units because their build pools keep refreshing as on map units upgrade to new equipment. I've built 40 Indian Divisions, but I could build 300 or 2000 if I wanted as there is no end to the refreshing of divisions when the on map ones get replaced with new tech. I actually think all nations can do this, it's just that only a few have the means to build enough units that the problem stands out with those nations. I should mention though, that my guard corps have not refreshed, but regular British divisions have refreshed, so perhaps the tech that is causing this does not upgrade the guard units. Or perhaps just a single element type in the corps isn't upgrading and they will refresh later when that element gets a tech upgrade, I don't know. Edit: Here's a screenshot to show you what I mean. I have built 40 inf divisions and 20 cav divisions, but the inf pools have 13 more divisions available and only recognize 15 of the 40 divisions on map as those have not yet upgraded. As those 15 divisions that are on map upgrade they will vanish from that number slot and a new division will become available to be built for each one. This is an endless process, unless perhaps later techs finally remove the old tech division stacks from the build pools. Adding the on map recognized divisions of 15 to a current pool of 13 exceeds the original limit of 25 by three. 2 of the 40 Indian divisions on map are actually AWA nationality and not original to the 25 stack limit for Ind divisions. The AWA division stack of 2 divisions in the at start pool have not refreshed, I suspect they refreshed as Ind nationality divisions. That would explain 2 of the extra divisions, not sure where the last one comes from, perhaps it arrived via event or colony troops gain or something. I believe this is the problem with every nation, as the tech upgrades events are generic (apply to all) and they just continuously "add" new units in FP, while converting the older ones (both map and FP), so it's inflationary. We should work a fix where tech upgrades do not add units in FP, except rare cases of brand new units. Plus, as a safety measure IMHO a fix that would automatically remove units from the older types from FP, after an upgrade, as it seems there is a code (or event script) issue that does 'kill' or make 'obsolete' the older models... hence the issue James points out. I think the real issue is that no new tech units are getting added to the force pool when the upgrades are researched. The divisions kept in the pool are old tech so the engine only recognizes old tech units on map. Without a new tech stack in the pool the engine can't see the new tech divisions on map when old tech divisions upgrade to them, so it treats them as destroyed and dumps a division back into the pool to get rebuilt. The engine needs to delete old tech stacks but it also needs to add a new tech stack. Currently everything in the pool here is old tech, I can't build a new tech unit.